We do a lot of our presentations with out iPads. It’s just easier to move around with and make last second changes. One item that people always point out is the graphics in our iPad created presentations. We can do really nice photos and images but graphics and charts done within the iPad presentation software are a bit behind that of the desktop creations. A solution was found by a team member yesterday that spread like wild fire once he use a graphic he created in a presentation. Simply put, TouchDraw on the iPad lets you create quick colorful to highly detailed art. You are doing the work as a Vector image but can be exported to the iPads photo area as well as a PNG, PDF, Vector or Visio. Setting up work flow charts has been a favorite to be done on the iPad since it is so quick to drag things around with your finger to arrange. 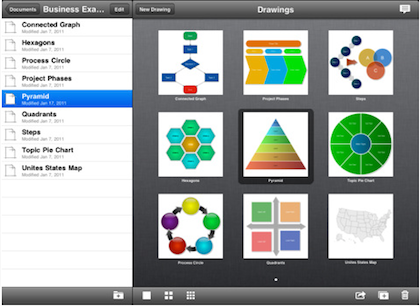 With TouchDraw, we now have the ability to make those charts pop with colors and more control over size/shape of every bit. Every bit of the graphic you create is independent so it can be moved around on it’s own – much nicer to use than the paint options we have been using. We are still exploring all of the features but thought it was worth a mention early on. Look for us to toss up a couple creations in an update to this post over the next week. – Image Tool – Add images from your photo library to your drawings. – Grouping/Ungrouping – Group and ungroup your figures for complex drawings. – Zoom – Unlimited levels of multitouch zoom. – Undo/Redo – Multiple levels of undo and redo. 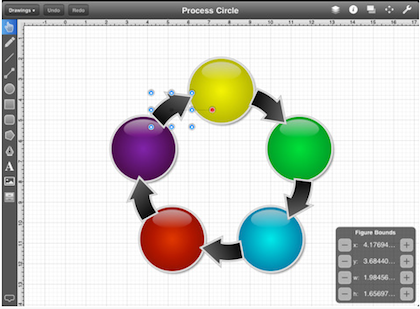 – Cut, Copy and Paste – Move items between drawings or into other apps. – Feedback – Overlay panels provide measurement details on your move and zoom actions. – Grid – Unit aware grid support with optional snap to grid support. – Photo Library – Export your drawings as an image to your photo library. – Background Colors – Specify the background color of your drawing. – Alignment – Align one figure to the bounds of another. – Ordering – Control the ordering of the shapes within the drawing. – Shadows – Support for drop shadows. 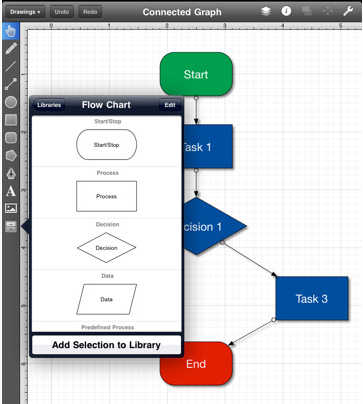 – Connectable Graphs – Support for creating flow charts and other diagrams. – Shape Libraries – Create your own libraries of re-usable shapes. – Support for display on external screens via a VGA adapter.